Dr. S. Suresh Babu MD (Ayur.) a renowned writer and Practitioner of Ayurveda, has been Teaching, guiding and writing for the cause of Ayurveda for more than two-decades. He won "Vaidya Ratna P.S. warrier prize" of Arya Vaidya Sala, Kottakal for "Best The-sis" Three times- consecutively in the years 1994, 1995 and 1996. A Hat Trick Achievement! Presently Dr. Babu is working as Asst. Professor in the Post-graduate center, Dr. BRKR Govt. Ayurvedic College, Hyderabad. · A Treatise on Home remedies (2000) Pustak Mahal. · Green Remedies: Healing Power of Herbs (2001) Pustak Mahal. Ayurveda with a ray of hope. In this backdrop an Humble-attempt has been made to describe certain Myopathic disorders like muscular dystrophy etc. 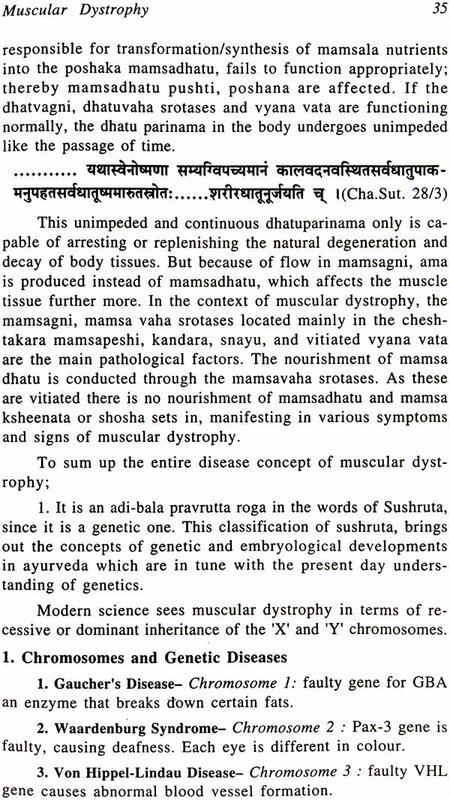 From the Pure Ayurvedic Point of view in addition to the Modern out-look, along with the management of these diseases covering the Latest Research Taking place in the field of Myopathy. It's a Timely book on current problem. Please don't miss to read. Myopathy is an emerging group of diseases posing a grave challenge to the modern medical field, wherein the basic need of life- movement is restricted or affected fully. This leads to dependency on others for routine activities thereby inflicting a stigmatizing effect on the patient. The term 'Myopathy' can reasonably be used to define any disease or syndrome in which the patient's signs/symptoms can be attributed to pathological, biochemical or electrophysiolo- gical changes which are occurring in the muscle fibres or in the musculointerstitial tissue. There is no evidence that the symp- toms are wholly secondary to the disordered functions of cen- tral or peripheral nervous system. In simple words the term 'myopathy' is used to cover all diseases which are considered to be due to primary abnormality of skeletal voluntary muscle fibers or the interstitial tissue between the fibres. This group of cases would include many diseases which appear to be geneti- cally determined as well as those which are inflammatory, meta- bolic, endocrine and drug/alcohol induced in nature. Some of the prominent features are muscular wasting, de- generation, abnormal gait, difficulty in running or climbing stairs etc. A degree of disability usually persists in the victims (the Hallmark of myopathy). As these are primarily voluntary muscle disorders, pro- gression of the muscle disease is variable. In some diseases progress is very slow, while in some others it is rapid. Some people maintain the state for their entire life, while others even- tually use a wheel chair or other mobility device. Usually the life span is unaffected in many myopathic disorders. However in congenital myotonic dystrophy some children die within a few hours of days of birth, due to problems with sucking, feed- ing and breathing. 2. To build up a fairly reasonable perspective of ayurveda on myopathy in a pure scientific spirit.